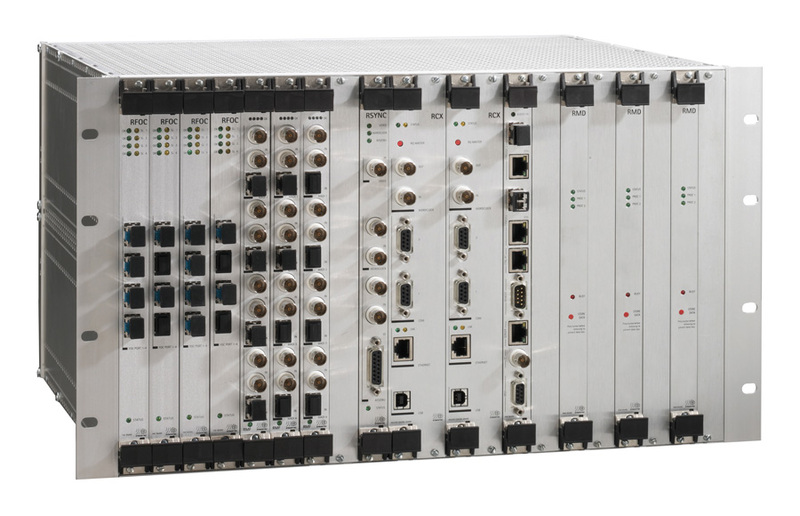 A powerful MADI routing system offering 16 MADI I/O ports and 1,024 audio channels. Fully assignable routing at both port and channel level; multiple MADI streams may be routed independently with different sample rates if wished. Configurable for redundant operation. Available with optical SC, BNC and SFP physical I/O. The M.1k2 belongs to the DirectOut range of MADI interface and routing products. MONTONE.42 converts bidirectionally between MADI and AES67/RAVENNA, and EXBOX.MD between MADI and Dante. For interfacing between MADI and AES3 and/or analogue see the ANDIAMO range; note the ANDIAMO.MC routes mic inputs directly to MADI streams. DirectOut Technologies’ M.1k2 is a MADI router with 16 MADI I/O ports. It may be used to route entire MADI streams: both one-to-one and one-to-many routing is possible, allowing the unit to act as a MADI distribution amplifier. 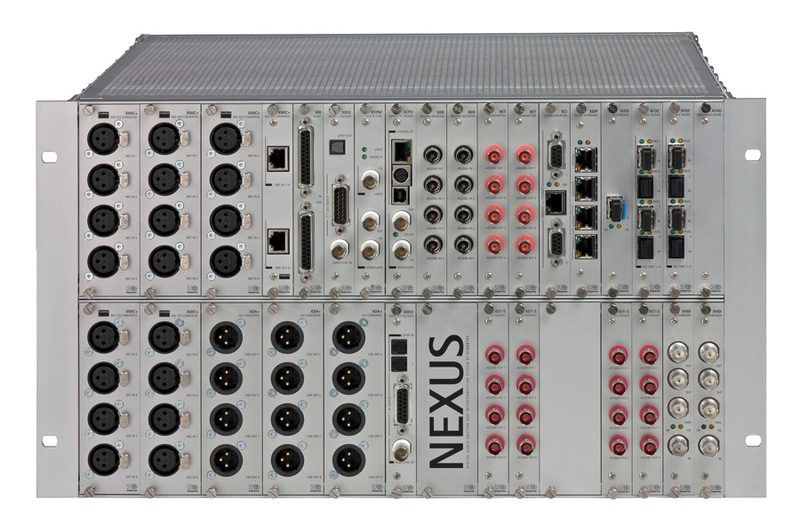 It can also be treated as a 1024 x 1024 channel routing matrix, where individual audio channels are de-embedded from their input stream, routed as required and re-embedded into an output stream. I/O is via two front panel slots, each of which supports eight MADI I/O ports. Each slot can accept any of three MADI interface modules differing only in connectivity. The options are: eight dual SC optical ports, 16 BNC connectors, or eight empty SFP carriers for user’s own choice of optical or coaxial MADI cartridges. The optical module can be specified with any mix of singlemode and multimode types of SC ports; an alternative SMART version of the SFP module is also available, which provides a detailed view of the status of the physical MADI connection at each input port. All MADI formats are supported: 56/64 channel, 48k and 96k frame and S/MUX, at all common sample rates from 44.1 kHz to 192 kHz, +/- 12.5% varispeed. The M.1k2 has no local controls, all configuration and routing being set up through a series of web pages, accessible using any standard web browser on a compatible device connected to the unit’s Ethernet port. The matrix allows for the routing of both complete MADI streams and the individual audio channels contained within each stream. The matrix may be “split” in any manner, allowing several independent MADI signals to be routed as required. All input signals are refreshed; User bits and embedded serial data can be routed independently of the audio data. Labels can be appended to each MADI stream and audio channel through the browser pages, with an import/export function using the common CSV file format. The M.1k2 is particularly versatile in its handling of clock references, making it useful in large-scale broadcast environments where multiple and disparate MADI sources may be encountered. Each MADI port can have its own clock reference: itself or any another MADI input, external wordclock or video black-and-burst. The internal system clock is available at two BNC connectors to permit the M.1k2 to be the system master. Snapshots are supported: these cover the entire unit configuration including routing, clock assignments and labels. They can be recalled as needed, simplifying the repetition of regular operations. Definable user permissions are also supported, ensuring that different users only have access to certain areas of the matrix, of vital importance when different MADI streams are in use for different purposes. The M.1k2 supports fully redundant operation in several ways. Any two MADI inputs may be defined as a redundant pair, with automatic, click-free switchover occurring if that defined as the primary source fails. Two (or more) M.1k2 units can be configured as a permanent redundant pair, with the “backup” unit automatically mirroring all aspects of the configuration and routing of the primary. Dual, internal universal PSUs are fitted, with separate, fused IEC inlets and AC switches. The M.1k2 also supports globcon, a powerful software application which can control any combination of DirectOut products through a simple, standardised GUI. globcon is available in Mac, Windows and Linux versions and may be downloaded free of charge from www.globcon.pro. Additional remote control facilities are provided in the form of RS-232 and RS-422/485 serial ports, MIDI I/O and GPIO ports. Additionally, the routing of serial or MIDI data can be defined independently of the audio routing, and the data freely embedded in the output MADI streams as required. The M.1k2 is built in a strong steel chassis and occupies only 2U of rack space. All connections are made to the front panel, making it ideal for MCRs and OB vehicles: the rack handles are in the form of dual cable/fibre tidies. The unit is fan-cooled.